Who Owns The Archives Of A Vanishing Iraqi Jewish World? : Parallels In 2003, U.S. forces discovered a trove of Jewish documents in a flooded Baghdad basement. They tell the tale of a once-thriving Jewish community. The painstakingly restored documents will be exhibited in the U.S. before they are returned to Iraq. But some Jewish groups are trying to prevent that. This colorfully illustrated French and Hebrew Passover Haggadah was published in Vienna in 1930. Caption on the image: "Eating Matzah." This restored document is part of an exhibit at the National Archives in Washington, D.C., that opens Nov. 8. When U.S. troops entered the basement of Saddam Hussein's secret police building in Baghdad a decade ago, they were looking for weapons of mass destruction. They didn't find any. But they did discover a trove of documents from what was once a thriving Jewish community in Baghdad. Those documents go on display beginning Friday in Washington at the National Archives. The big question now is who owns the documents: the U.S., the government of Iraq, or Iraqi Jewish exiles? Documents from the Iraqi Jewish community dry outside the Mukhabarat, Saddam Hussein's intelligence headquarters, in Baghdad. Back in 2003, that Baghdad basement was flooded, thanks to a U.S. military strike. Floating in the muck, according to Doris Hamburg of the National Archives, were scads of documents. Some are centuries old, others more recent. They chronicle Baghdad's role as a center of Jewish life. There were holiday prayer books, sections of Torah scrolls, books on Jewish law, and Jewish community organizational documents. Hamburg wasn't there when the documents were found. She got a call from Iraq's interim government, the Coalition Provisional Authority, which asked her how to save the documents. Hamburg told them: freeze them, it's the best way to prevent mold. Then she rushed from Washington to Baghdad to inspect the collection. Somehow, in the chaos of post-invasion Iraq, authorities had procured a freezer truck, which created a strange work environment. "It was below freezing in this truck," Hamburg recalls, "and outdoors it was over 100 degrees. And so you were going between this frozen environment, to this very hot environment, and after a while you started to get headaches." 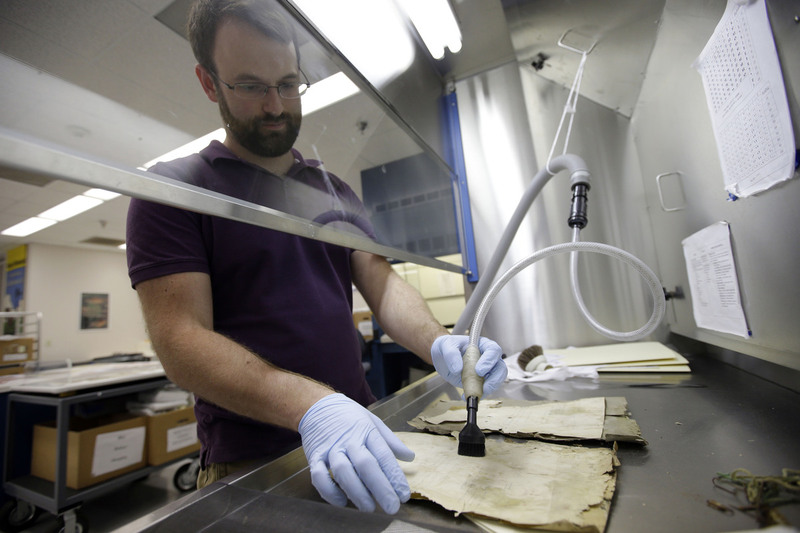 Patrick Brown, a conservation technician, works on Iraqi Jewish documents at the National Archives in College Park, Md., on Sept. 30. 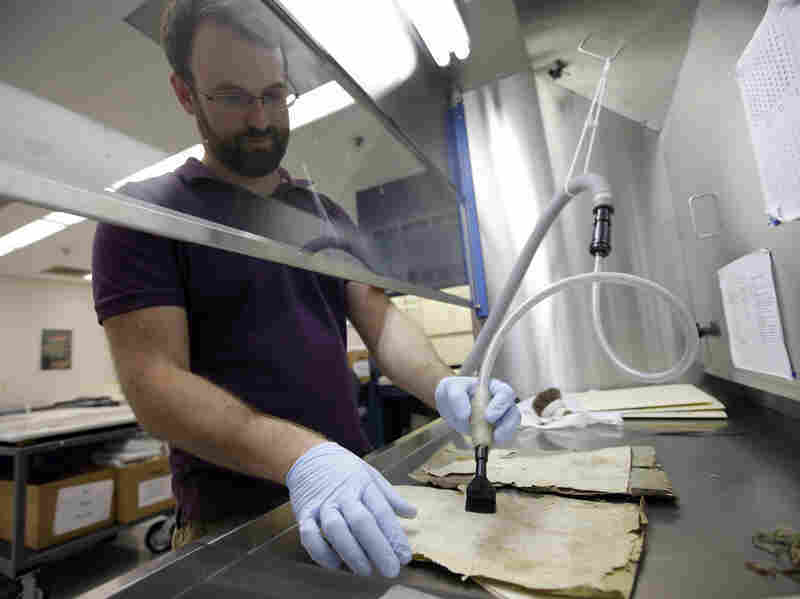 After an initial assessment, the National Archives agreed to take charge of restoring the documents, and the trove began its odyssey to preservation facilities outside Washington. For the better part of 10 years, experts have been working in a special lab at the National Archives and Records Administration in Maryland, teasing apart stuck-together pages, and they're still at it. The transformation could be called miraculous. 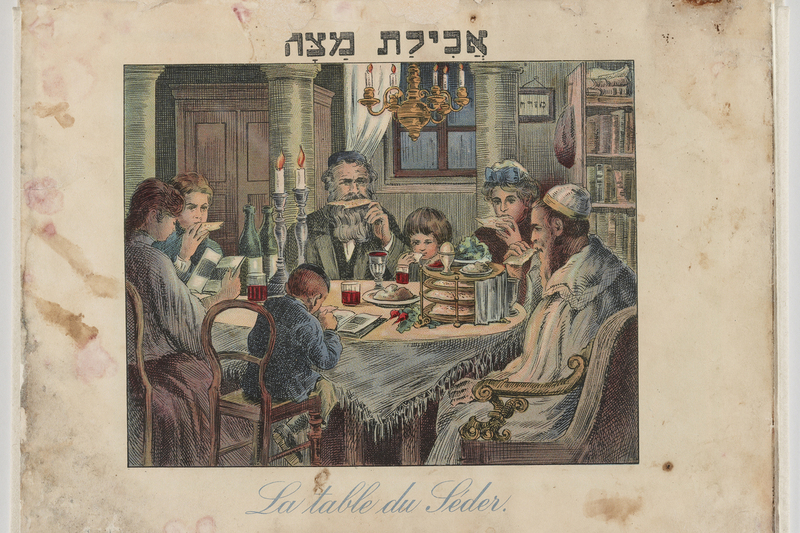 A Passover Haggadah has been restored from a moldy mess into a museum piece; the beautiful cover drawing once again shows a festive Passover meal. 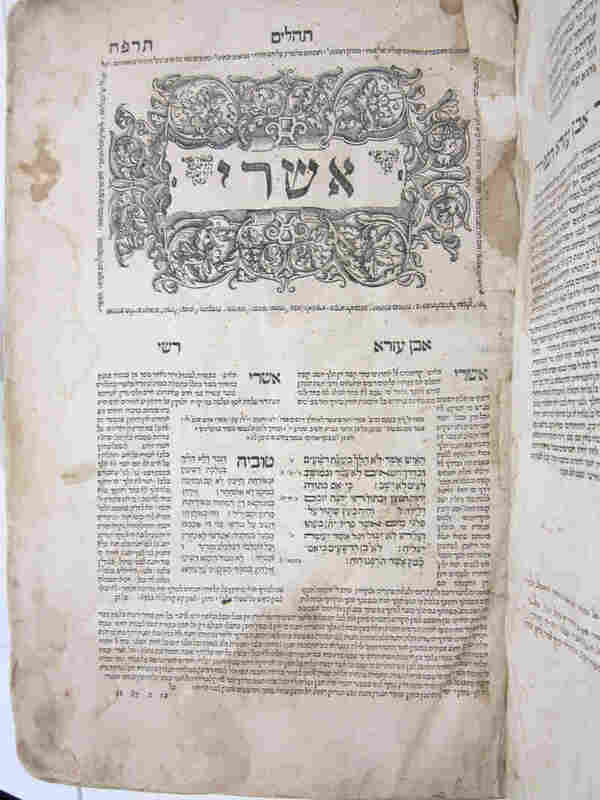 The text is in Hebrew and French, another sign of the cosmopolitan community that relied on many languages. The National Archives is best-known for safeguarding documents like the original Declaration of Independence, so this is an odd project — and its first work on non-U.S. material. Kelly opens a file up under a fume hood, which protects her from having to breathe in any mold. She then suctions off any remaining mold with a tiny vacuum, going page by page through each collection of papers. Many of the records are not religious. Some document the parallel administration that organized Jewish life in Baghdad. After World War II, there were still more than 100,000 Jews in the city, but most fled rampant persecution in Iraq after the establishment of the state of Israel in 1948. Those who stayed continued to attend separate Jewish schools, and their records have survived. Librarian Dina Herbert shows me the records of one student. "There [are] grades, and enrollment, and photos," she says. "Sometimes there's even an elementary school photo, a middle school photo, and a graduation photo." 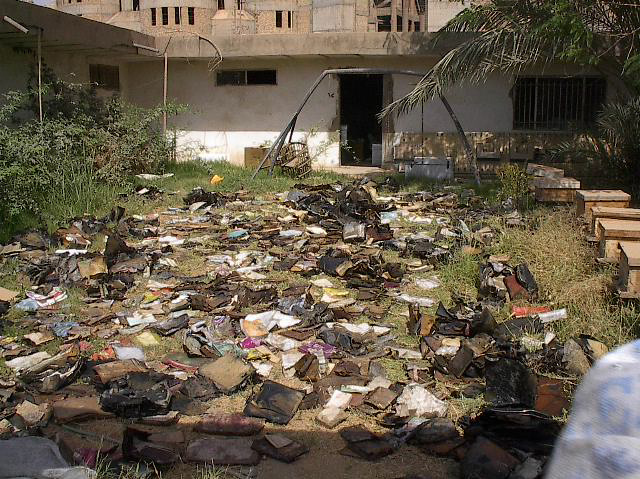 It's not clear why Saddam's secret police decided to confiscate and store this mix of religious texts and administrative papers. But the personal nature of some documents has raised this question: Who owns this stuff? For Maurice Shohet, there is little question: "This material is the patrimony of the Iraqi Jewish community." Shohet grew up in Baghdad, but he and his family fled when he was 21. He now lives in Washington and is president of the World Organization of Jews from Iraq. Shohet has been trying to get the Iraqi government to give up its claim on the documents, so they can be returned to individual Jews, or to the community at large. "It was confiscated from them, and logically it should be returned to them," he says. Shohet and others have been urging the U.S. and Iraqi governments to change the 2003 agreement, which says the materials should return to Iraq after they are exhibited in Washington and New York. Filmmaker Carole Basri, the descendant of Iraqi Jews, says the Jewish population of Iraq is down to a handful of people, so the materials should remain accessible to the exiled population. She says anything would be better than sending the collection back to Iraq. "I don't think the situation in Iraq is safe enough for it to go back now," Basri says. The U.S. State Department and the Iraqi government had no official comment and would only point to the agreement, which says the collection must go back. The National Archives is putting all the documents online, so that people anywhere can see what remains of the Iraqi Jewish community that was.